Ancient Section: This is the biggest section, and consists mostly of Latin and other ancient languages. 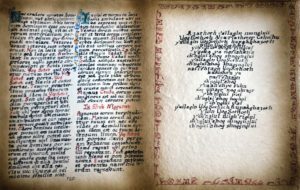 Many of the passages taken directly from the Necronomicon were translated into Latin and written here. 17th Century Section: This section was added around the time of the Salem witch trials. It is written in the English of the 1600s with different handwriting, and by someone with low spelling and grammar skills. It contains a scattering of ancient magic mixed in with the English. Victorian Era Section: Added in the mid-1800s, this section is a much neater handwriting and generally better English. It adds a few questionable arcane choices, which in turn lead to the fourth and final section. Victorian Era Deranged Section: It is unclear if this section was added by the previous author (or by their heir) but for certain, this relatively short section shows a distinct degrading in mental stability.